Whether it is working on a TV show, a movie, or even some music, whatever it is that the outstanding Isabela Moner puts her heart and passion into, everything turns out to be just as spectacular as she is! The stars have always pointed to success for the extraordinary Isabela Moner and we see how she continues to take over this entertainment world by storm in such a fantastic and terrific way. Isabela Moner has been leaving us all in awe more and more as each day goes by with all of her exceptional projects. She starred in Nickelodeon’s 100 Things To Do Before High School and she also took on another exciting role in the movie, Middle School: The Worst Years of My Life, which is set to premiere soon. In addition, Isabela Moner has even more incredible projects ready to be released, such as Nickelodeon’s highly-anticipated movie Legends of the Hidden Temple, which she just recently wrapped. The phenomenal movie, which will bring back a rush of 90’s nostalgia, is based on the iconic 90’s Nickelodeon game show, and its official trailer just recently released during the San Diego Comic Con. Needless to say, we all wish it was the fall so we can see the movie already. Also, Isabela Moner has joined one of the biggest movie franchises to date, as she takes on a stupendous role in Transformers 5. Hard work, passion, determination, and the lovable personality and talent that she has, it’s clear to see that Isabela Moner will have even more continued successes moving forward! 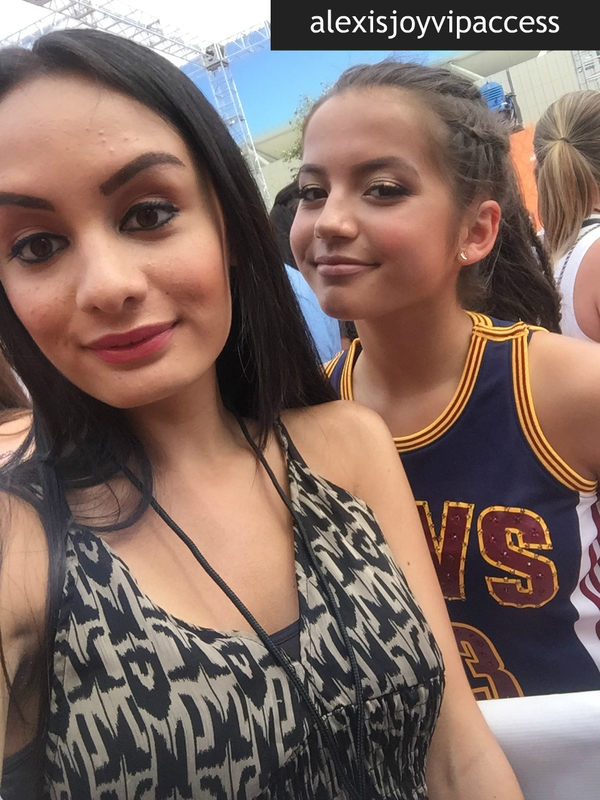 I, Alexisjoyvipaccess had the greatest honor of covering and attending the renowned and prestigious 2016 Nickelodeon Kids’ Choice Sports again, celebrating everyone’s favorite iconic sports stars and sports moments; and I had a blast catching up with and interviewing the beautiful Isabela Moner again at the event. Isabela Moner dished exclusively to Alexisjoyvipaccess all about what it was like working on set of Legends of the Hidden Temple, what the atmosphere was like on set of Middle School: The Worst Years of My Life, and so much more only in our VIPAccessEXCLUSIVE updated interview. Isabela Moner even spills on the two sports stars she would like to have on her sports team and Stephen Curry is spotted in our interview – see it all happen in our updated VIPAccessEXCLUSIVE interview below. Thanks for another fun interview, Isabela – always so great chatting with you! Check out my updated VIPAccessEXCLUSIVE interview with the gorgeous Isabela Moner at the 2016 Nickelodeon Kids’ Choice Sports below! Previous VIPAccessEXCLUSIVE: Jagger Eaton And Alana Smith Interview With Alexisjoyvipaccess At The 2016 Nickelodeon Kids’ Choice Sports! Next VIPAccessEXCLUSIVE: The Sensational Andre Drummond Interview With Alexisjoyvipaccess At The 2016 Nickelodeon Kids’ Choice Sports!